Here’s a novel idea for an automaker: Open stores in an area where people are not shopping for cars. That’s the strategy of Tesla Motors, the builder of high-end electric cars. 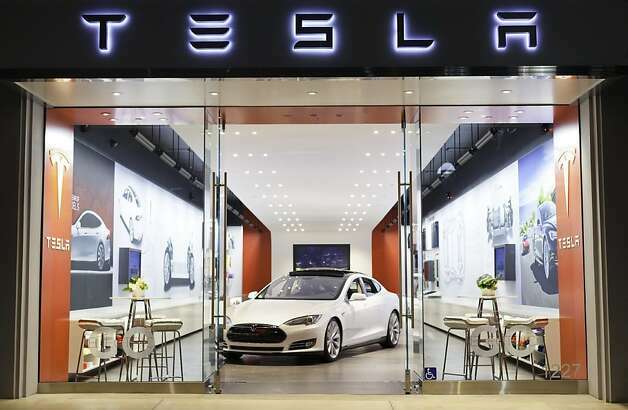 The Palo Alto automaker opened its 12th North American store last week on the Third Street Promenade in Santa Monica. It’s flanked by an Adidas store and Club Monaco, a trendy apparel seller. Parking is a block away in a public garage. Think Apple rather than Chevrolet. “We are deliberately trying to engage with people when they are not thinking about buying a car,” said George Blankenship, Tesla’s sales chief, who previously worked in the store divisions of Apple and Gap. That’s the best way to educate people about how electric cars work, how much they cost to operate, and what Tesla has to offer when they eventually go car shopping, he said. Tesla is a small-volume auto company that just started selling its flagship Model S, a sporty, full-size hatchback. The car sells for about $50,000 to more than $100,000 depending on trim level and options. Tesla builds the Model S at a factory in Fremont, where it plans to also make the Model X, an electric sport utility vehicle built on the same platform and sharing much of the technology, starting late next year. Commercial Utility Cart | Electric Cars For Sale | Are YOU Looking for ELECTRIC CARS FOR SALE? Here's MOTOR SCOOTERS FOR SALE information for you!